A long-running southwestern Michigan wine festival gets new digs this year. 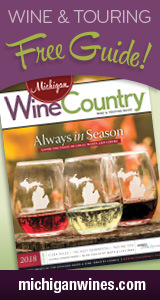 The Lake Michigan Shore Wine Festival, coming up Saturday, June 16, was previously held at Weko Beach in Bridgman. Now it’s moving about 3 miles down the road to Warren Dunes State Park in Sawyer. In her June Hour Detroit Michigan wine blog, Cort gets the scoop on the new location for the Lake Michigan Shore Wine Festival!